On January 4th, 1996, Michael Eisner and the Walt Disney Company came to an agreement with Capital Cities/ABC on a merger between the two companies, forming what is known today as Disney-ABC TV . In addition to ABC Television Network, Disney-ABC owns multiple cable channels including Disney Channel Disney XD, ABC Family and ABC News, as well as a controlling stake in ESPN and an equity holding in A+E Networks. Disney-ABC has done a very fine job of diversifying their TV offerings, broadcasting programs for every sort of viewer imaginable. The company’s two most popular offerings are 4-time Emmy winner Modern Family  and the company’s longest running primetime drama, Grey’s Anatomy. In addition, ABC has created successful shows based on existing third-party content, such as Once Upon a Time and Agents of S.H.I.E.L.D. ABC also airs a large number of successful unscripted shows, such as The Bachelor and Dancing With The Stars, talk-shows in both the morning (The View) and late-night (Jimmy Kimmel Live! ), live college football and NBA games, and national news shows such as Good Morning America. ABC Family and the various Disney channels offer popular youth-oriented series such as Pretty Little Liars and the cartoon Gravity Falls. In this upcoming season, Disney-ABC plans to bolster its broadcast schedule even further by collaborating with well-respected directors and producers such as David O. Russell and Bryan Singer on the shows The Club  and Black Box  , respectively. New King of Late Night? On April 3, 2014, Late Night host David Letterman announced his retirement from the show, and from late-night TV in 2015. Stephen Colbert will replace him on CBS in the same time slot after his departure. With David Letterman’s retirement in 2015, ABC’s Jimmy Kimmel will have the longest active run of late night hosting on broadcast TV with a consecutive 11 years on the air. Along with Colbert, Kimmel has already begun competing with the recently appointed Tonight Show host Jimmy Fallon on NBC, who’s show shares a timeslot with Kimmel. So far, among the two shows, The Tonight Show has dominated in TV ratings. However, Jimmy Kimmel Live is fast on Fallon’s heels in the digital department. After a stellar debut week (avg 6.2 million viewers), Fallon’s ratings have come back to Earth (avg 1.8 million viewers in its 2nd week). A report from Nielsen “SocialGuide”’s data, the number of impressions on Twitter for each show are comparable, and Kimmel’s uptick in viewership means that the margin between the two shows is closer than you think. These two talk-show stalwarts look to be set to compete for years to come, and ready to take on all challengers. .
On February 14, 2012, a company called Aereo created a product that was designed, in their eyes, to be the future of television. Aereo created a mini-sized antennae that effectively replaced a cable box and allowed consumers to “break free” from cable companies , all for a very affordable price of $80 a year. However, by doing so, Aereo was breaking many rules by not paying retransmission fees to the networks it carried, something that the cable providers are required to do. As such, cable companies swarmed Aereo with suits and injunctions within months, but to no avail . 2+ years later, Aereo is still operational, and now more faces have joined in the fight against them, including ABC. Recent advances in broadcast technology have seriously hindered TV’s chances at remaining a top broadcast medium in the past few years. Internet piracy, DVR and online streaming services have all impeded on the television’s reign atop the media market. However, it seems that ABC has found a way to turn the tables and use these new developments to their advantage. The best example of this is ABC’s smash hit show Scandal. 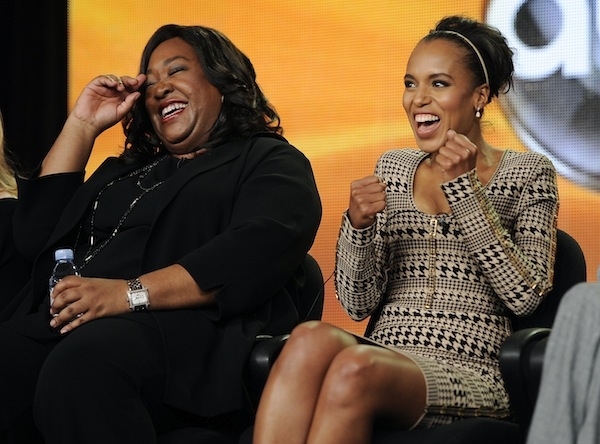 ABC has allowed the show’s creator, Shonda Rhimes, to run rampant on social media, and she does so with finesse. Her constant involvement and interaction with fans throughout the show’s run has led to a massive social media following for everyone from Rhimes, to the show’s star, Kerry Washington, to Scandal’s official social media accounts. To show just how astronomical its rise has been, take Scandal’s social media growth from its premiere up to the third season finale on April 17, 2014. At the former, Scandal had about 500,000 connections on Facebook, Twitter and Youtube combined. As of the third season finale, Scandal has 1.4 million views on its official Youtube page, 2.6 million followers on Twitter and almost 5 million fans on Facebook. As you would expect, Scandal’s most popular demographic is in the 18-49 range, who – not so coincidentally – are the demographic most present on social media networks . Fortune – What happens if broadcasters lose the Aereo case?